How do I love thee? Let me count the ways. Three. Yes, three is the answer. At least according to Eric Silverstein and his wandering intellect for tasty things. This reformed lawyer, now chef-inventor from The Peached Tortilla, marries the unlikely to the irresistible. He plays the fiddle of American border cuisine with an Asian accent. And in the process, lays out a passion for distinct tastes. Like a set of domino blocks which form an intricate pattern. A road from one tradition to the next. A series of connected metaphors of the mouth. 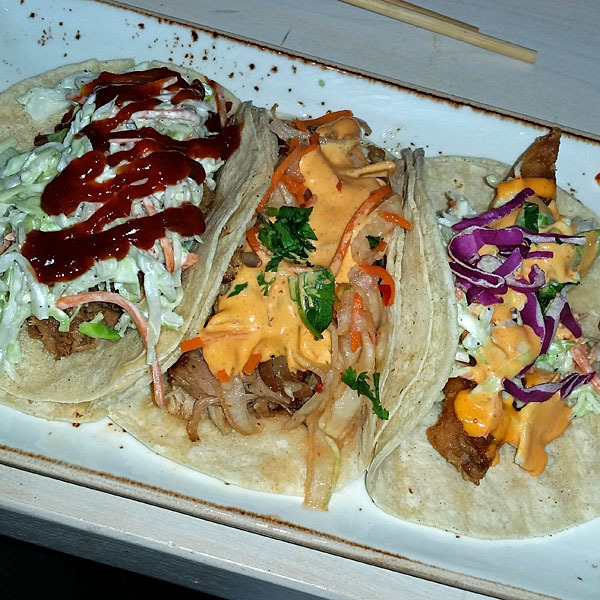 While fusion cooking is not new, Eric and staff know how to mash up flavors like space travel. There is no direction which points up. Every direction can be East or West. It all depends on where you fix your eye. Instead, what snares attention is whimsical comparison. It’s an artifact of the connoisseur: to study an object from different angles. And in doing so, remark on each facet. Take for example the endearing treatment of “Tre Cauliflower.” It’s a hummus, a pickle and grilled steak all made from the same vegetable (pictured above). Amplified by crispy onions and crumpled nori flakes. And while it does not contain any meat it remains an earthy, umami-driven portrait of what can be. 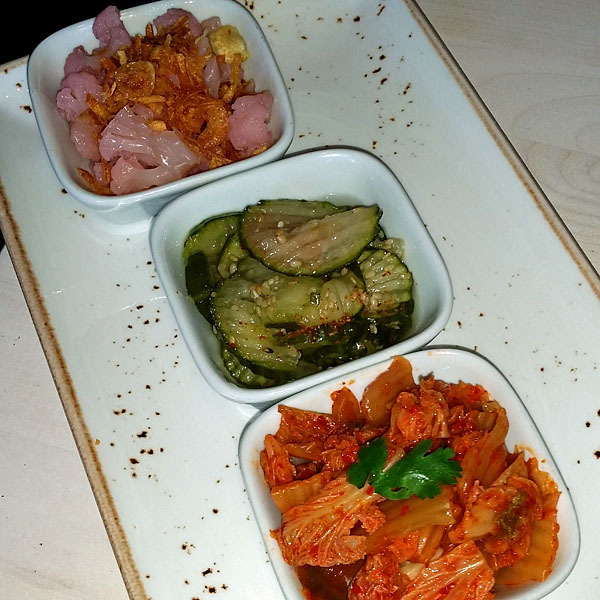 We are re-introduced to the familiar with “Banchan Pickles.” Three approaches each with a unique vegetable and seasoning. Eric invites us to bite back on vinegar. To roll around in hearty flavor profiles. From tart peach to sultry sesame to musty kimchi-style. Three songs unified by the siren song of vinegar but cleanly distinct. Even when the Peached Tortilla praises a single taste object like roasted brussel sprouts, it dares to whiplash the palate with three radically different signatures. 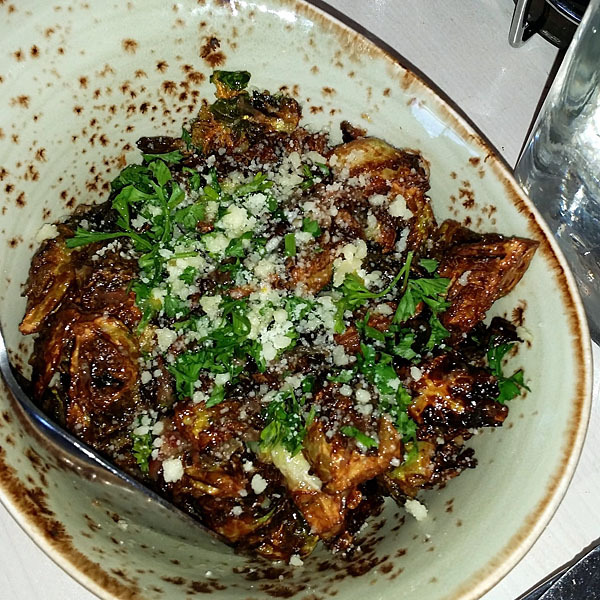 Diners fall into the carbon-charred cavern of these roasted mini cabbages. The dish is dimensioned in a sweet, smokey bacon jam. Then topped with an Italian styling of lemon oil and parmesean dust. Clearly this is the love-child of the profound and the profane. A secret kiss between heavenly folk and dust witches. For it’s signature course, the “Peached” dances-with-tacos. It’s how they recruited thousands of Austinites to be loyalists. From the early days of as a food truck and to it’s broader enterprise as a brick and mortar. Tacos share a consistent architecture: fill a corn tortilla with rich meat and bright vegetables then electrify it with tangy sauce. While they come from the same family, each stand on their own personality. The fish taco harkens the South. A porch-swing coleslaw and a lightning strike of chili aioli adorn fried whitefish. Next is the classic Bahn Mi raindance. Porkbelly takes the place of traditional porkloin in this showdown. Pickled daikon and sriracha mayo cut through the headiness. Lastly is an ode to Central Texas. Brisket, slaw and bbq sauce so thick and so smokey that the fire-brigade is often asked to stand down. Yes, The Peached Tortilla is passionate about what it does. They assemble and re-assemble ideas and flavor combinations the way a magician shuffles a deck. And in the end we are loved.